We have established ourselves as a renowned manufacturers and supplier of superior quality Jar Mill. Designed & developed by our experts using premium grade material and latest technology, these mills are widely applicable in various industrial sectors. Further, our offered range of mills is highly acknowledged across the market for its brilliant features such as fine finishing, rigid construction and optimum tensile strength. We offer these mills in different specifications such as dimensions and speeds in accordance with the requirements of our valuable clients. 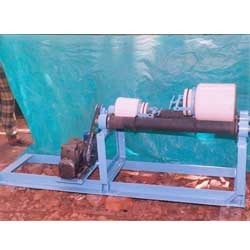 We have emerged as one of the reputed names of this industry engaged in manufacturing and supplying a vast array of Jar Mill. Manufactured using excellent quality raw material procured form reputed vendors, our dexterous team of professionals ensure production of a highly reliable range that are highly demanded across the market.